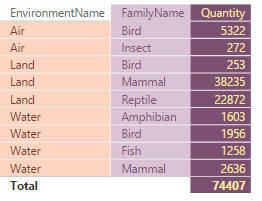 This feature allows you to colour table and matrix columns. Below are a couple of examples (the feature is more powerful for tables than it is for matrices). An example of how you can use column formats to ruin a table! 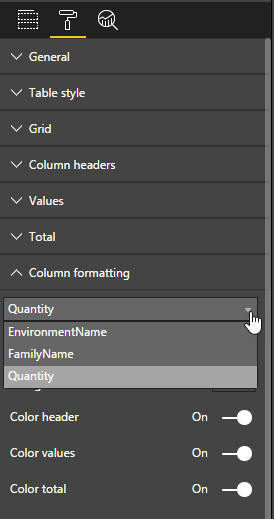 For the Quantity column, I've chosen to use the colours for the header, values and total rows. Here I've chosen not to format the values (otherwise nearly everything would appear with a purple background). Only the totals are coloured. 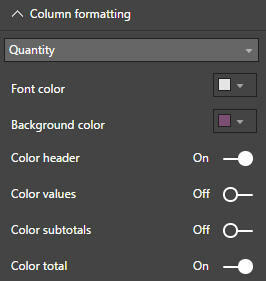 In case you're wondering, conditional formatting colours override column formatting colours!